New years wouldn't be complete without something good to eat would it? We are only having a few friends down to bring in the new year so instead of making the 5 appetizers I was gonna do I opted for something way simpler and less time consuming...just good ol' soup and sandwich. It has gotten really chilly here in Kentucky, especially at night so this will keep us all nice and toasty. I've chosen to make Kentucky hot browns and hot brown soup. I hope this won't be ham and turkey overkill. When I make reubens, I usually make reuben chowder to go along with them and they really accompany one another really well so I'm keeping my fingers crossed...if I know my friends they will eat it all up and won't care. We love to eat! I also wanted to make something to munch on and am trying a new recipe for Queso Blanco dip. It was interesting finding the white American cheese in the deli but luckily they had it. Will let you know how it turns out! 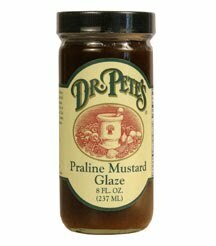 I also am fortunate that in our small town there is a tobacco shop that sells just about anything (like a convenience store) and they sell this wonderful "Dr. Pete's Praline Mustard Glaze." Any of you tried that before? Well, you are missing out if you haven't. You can use it on meats but I love to pour it over a block of cream cheese and serve it with crackers and it is just wonderful. Hard to explain...a sweetness and salty taste together. I bought a few bottles of that and will be serving it too. I'm making a butterfinger pie for the first time for dessert. It looks fairly simple. I opted to use a chocolate pie crust that is already made. Will also let you know how that turns out and if it is a keeper. I found another butterfinger pie recipe and was going to try it but it was way more complicated. Probably tastes better but I'm all for cutting back on time today. Our beloved Kentucky Wildcats play our across state rivals Louisville today at noon so I'm gonna be pressed for time. 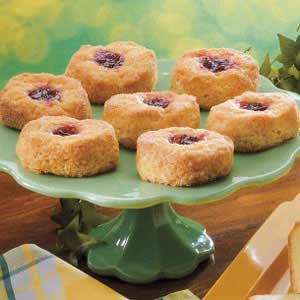 Enjoy the recipes!! Preheat oven to 350 degrees. Fry bacon, break into bits. Have ingredients measured before you start because this goes fast. Melt butter in saucepan over medium heat. Add flour all at once, whisking to make thick roux. Add milk, whisking to mix it in well. Stir in parmesan cheese. Reduce heat. Whisk egg lightly in cup or bowl. Stir in a little of hot sauce to temper the egg so it won’t scramble when you add it to the sauce. When egg is well mixed with a little for the sauce, whisk this combination into saucepan. Heat sauce until it becomes smooth and thick (you may have to add cornstarch to thicken), taking care not to let it come to a boil. Remove from heat. If you are using heavy cream, whip it and then fold it into the sauce gently. Check the seasoning and add salt and pepper to taste. Toast slices in toaster or broil until golden, do both sides. Trim crust from bread edges. Line the bottom of a casserole dish with one piece of toast, add a slice of ham, another piece of toast and end with a slice of turkey. Cover with sauce. Spread all of the sauce over the turkey. Sprinkle with remaining parmesan cheese and bacon bits. Place in oven and cook for 15 minutes or until golden brown. Garnish top of casserole with a slice of tomato. Serve while hot. Melt butter in Dutch pan. Add onions and cook until tender. Add flour, garlic salt and hot sauce and cook for one minute. Gradually stir in milk and cook until thickened and bubbly. Reduce heat and add cheese and cook until melted. Add ham and turkey (do not boil). Garnish with green onions, tomatoes and bacon. Mix first three ingredients together. Put it in pie crust. Chill. *Note: White American cheese can be found at the deli counter in most grocery stores. I could only find it presliced so instead of shredding it as stated in the recipe, I simply cut it into thin strips. Also, this dip reheats beautifully on low in the microwave or on the stovetop. Not that there will be any left…but if there is, now you know how to reheat. Heat the oil in a medium saucepan over medium-high heat. Add the onion and jalapeño to the pan and cook, stirring occasionally, until tender, about 5 minutes. Reduce the heat to medium-low. Add both of the shredded cheeses and 1/4 cup of the milk. Whisk or stir until completely melted. Mix in the tomato and cilantro, and add additional milk gradually as necessary to achieve desired consistency (I added about 1/2 cup total). Transfer to a warmed serving bowl and serve immediately. Sorry...just now getting around to posting about what has kept me so busy throughout the Christmas holiday. I was off work the week before Christmas and it's a good thing I was as I painted the ENTIRE time I was off. I painted dear hubby lightbulb ornaments to give away where he works for Pepsi every year. This year since my favorite Pepsi commercial showed a tropical santa who is on vacation and chooses Pepsi over Coke I decided that I wanted to paint him up so I did. I love designing as much as I love painting. Here is a picture of the finished ornament. I painted nine of them. I'm not much into repetition but I got through it somehow. I felt like a sweat factory. Also, this year my sisters and I decided to make one another something as a gift as we decided to only buy gifts for the kids. I have had 4 ice skates sitting on my craft room shelf for many years and so wanted to paint them up for someone that is near and dear to my heart so I decided that would be my gift. I never painted them before because they intimidated me so much. Why do we let things intimidate us like that? The good thing with paint is that if the project doesn't turn out the way you want it to then you can just coat it with more paint until you like the finished project. As some of you know, I have an aversion to spray painting. I admit I'm not good at it. It always runs on me so I've always favored the paint brush...imagine that. So I painted on my primer first so that the paints would adhere to the shoe. Next I took a sponge and sponged on blue and white together to make the background. Then I put on my pattern using graphite and a stylus and went from there. My friend Martha who is the most brilliant crafter I know (right up there with my late mom's brilliant craft knowledge which is a BIG honor) helped and nudged me along the way. She had painted skates before and she told me what to use and do. I love the added glitter to the blades that she suggested. Needless to say, my sisters and sister-in-law just loved them. Made me swell with pride when they opened them up as I had managed to not let the intimidation get the best of me. My niece who has taken after me and my mom has the love of crafting as much as us and I needed to make her something handmade also so I painted her this wooden frame I bought at Wally World. She is a freshman in high school and varsity cheerleader and she loves anything with their mascot on it. She is in the back row in the middle...tallest girl. Such a beauty and sweetness about her. Was such fun to paint on wood again for a change. In the olden days that is all I used to paint on until I found the love of painting on burnt out lightbulbs. This year I am gonna strive to paint on more wood. Back in the days when mom and I would cut wood together we would often joke "who needs diamonds and furs when you can have the wonderful smell of wood." We loved wood! I need to get back there some and enjoy the fun of cutting out wood again. And remember the wonderful memories I had with mom. Yeah...throw in a few tears. Well, that is what I've been up to...hope you have been crafting your little hearts out too! The countdown has begun for a brand new year. Many years ago I did away with resolutions as I never kept them. Every year I just strive to be better at things and be a better person and of course always struggling to lose weight. Isn't that just part of being a woman? I am planning on learning a few different painting techniques. I bought a DVD from Jillybean Fitzhenry that I am going to study hard and learn how to paint santas like she does...they are more than wonderful. You know how much I love my santas! 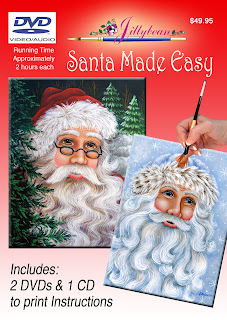 And to paint fur like she does...well, I'd just be in heaven. Also, naturally as I do every year I tell myself that I'm gonna start sooner and paint things for my Etsy shop, get it full...I really hope I will do that. Right now I'm pretty motivated to start painting again and not burnt out YET. At Christmas I always try to watch a few Christmas movies because I love Christmas so much and they really add to the mood and excitement. 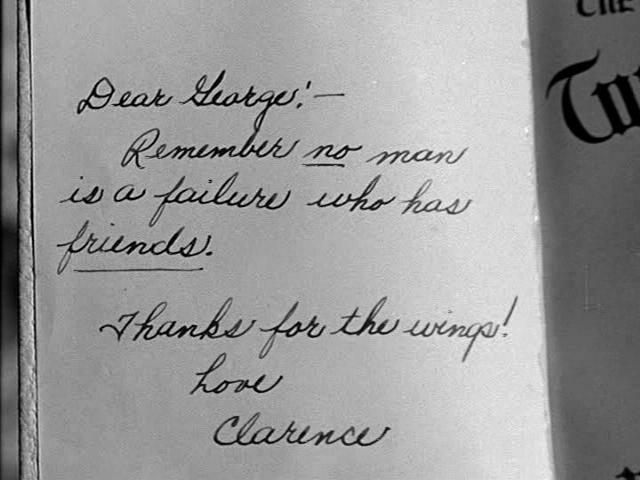 After all these years I finally finished watching "It's a Wonderful Life." I have no idea why I only got a part of it watched throughout the years but I never managed to watch it to the end. I've always heard the hype about it and never quite understood, after all it is in black and white. Well, I totally GET IT now. What a meaningful movie. It really makes one think long and hard after the movie is over. Makes you really appreciate the life you have and your friends. I came away a much more grateful person than I usually am. I'm not one to take things for granted by any means as I thank the good Lord above daily for everything I have. Every person in the universe should be made to watch that movie, perhaps it should be mandatory for students to watch in school. Perhaps it would be the start to world peace? We can only pray that would happen. The other movie I watched was a cutesy movie called "Holiday Switch" and it was about a gal who marries a poor construction worker, has two girls and is miserable because they can barely make ends meet. She finds herself dreaming about what life would have been like if she had married a rich boyfriend from high school. She bumps her head and then she is transformed into the rich boyfriend's wife. Needless to say, at the end of the movie she wants to go back to her old poor life as being rich isn't all it is cracked up to be. You come away from that movie very grateful and happy for the life that you have and realize that not being rich ain't so bad. I've always said I could live in a cardboard box and be happy as long as I had my painting with me. 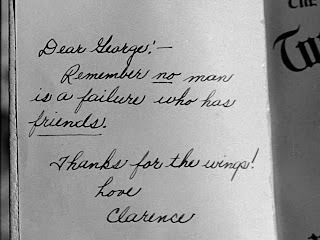 Well, sorry to have gone on and on but I just hope that each and every one of you have the very BEST new year ever! Cheers!